recommended for: Fans of Chuck Palahniuk or old-school horror. Fans of psychological thrillers, classic horror movies, crime shows (like Criminal Minds), a darker Supernatural, and the human element in horror. 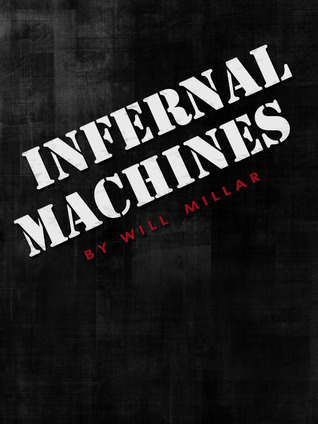 Infernal Machines is a page from a classic horror movie. Only this isn't a haunted house--it's a haunted town. Not by ghosts or ghouls, necessarily, but by people--the strange, the evil, the ones with control of an even greater evil. The focus on the characters makes it strong and gives you a peek into the psyches of several very different types of people. The Nazi-next-door. The video-game-playing good boy. The dark magic shop owner. It takes a little while to get the hang of the big cast, but once you do, you'll be pulled along deeper into more and more twisted adventures. I found myself really enjoying the gritty procedural-like prose and the unexpected twists. A must for fans of modern horror. It's difficult to tell what's going on for a while. This isn't so bad in the long run, because the confusion builds a lot of suspense. It just makes it harder to get into at first. But once it picks up, it doesn't let go. I found myself really getting invested in the secrets each character has. The weird Cliff and his experimentation killing animals. The mysterious Mr. Cardiff. You're dying to know the whole time how all these stories are going to connect and what terrible things are going to happen. It was an uncomfortable feeling in the way that psychological thrillers do best--the kind of uncomfortable that only authors with good atmosphere can produce. It's a cool concept. A weird town. There's something it reminds me of on the tip of my tongue but I can't pin it down. Suffice to say, I loved the idea. It's like a circus or something, with that small town feel. I can't describe it. There was just something inherently eerie about the isolated Washington woods location, the railroad bums, the river stores, the trailer park Aryan gang. You get to know everything as well as if you lived there. But the whole time, you know there's something evil bubbling under the surface. I knocked it down just because there are so many of them. With around ten or so voices, it takes a while before you can really get into everyone's head, which is important for me in getting into a story. I thought it could have stuck with just a few and done the same job, maybe with a few deviations along the way to add some scenery. But besides the confusion, all the characters are remarkably well-explored. I felt like I knew some of them right away (e.g. Cliff, Stoner) and it made it a lot easier to ground myself in the story. The style has that gritty feel like crime procedurals. There's even a cop! I kid, but seriously, the style gives this story a really great atmosphere. Dark, kind of grungy, even a little gory. A little like Palahniuk only without his particular brand of psychopathic elegance. More concrete. I was really impressed with it and I think it made the story stand out a lot from the other indie horrors you see out there. I thought there could have been a lot more cut out. I'm big on conciseness, so I like to see a lot of pruned adjectives, pithy descriptions, etc. OR, if there is going to be floweriness ala Jane Austen, tight floweriness. Note: I received this copy free from the publisher. The price of the book and its origin in no way affected my stated opinions.